Based on this new information, it appears that Apple is targeting a ~10 screen size for this Netbook. The addition of a multi-touch screen adds an interesting twist to the concept of a netbook which is traditionally a clamshell miniaturized laptop. MacRumors, one of the best Apple reporting sites, discusses the possibility of a Apple Netbook based on a flurry of information floating around the Interwebs. I'm not sure a Netbook would make sense since it would obviously cannibalize sales from the more profitable MacBook line. What would make sense to me is actually a tablet style device. Imagine an iPhone that was twice as long and three times as high (or basically 6 iPhones in a Brady Bunch-esque configuration). 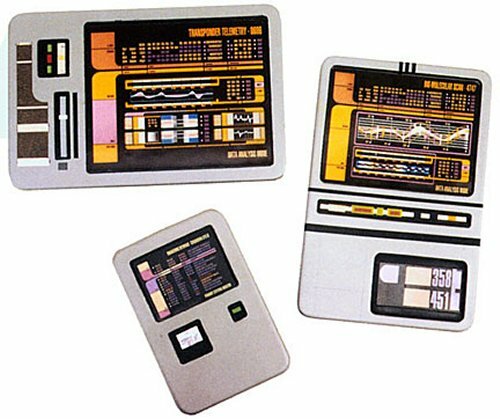 It makes me think of the tablets they had on Star Trek: The Next Generation. Way too cool. BTW, much thanks to Garry of Posterous for showing me how to do the block quote and using the Posterous Bookmarklet app. Also, way too cool.